What Smart Devices Work With Security Systems - Secure Tech, Inc.
With the advancement of technology, it’s getting easier and easier to automate and secure our homes and lives. The hard part is figuring out how to do so. There are many different devices out there to help us feel more secure and keep us safe. It’s hard to keep up with all the latest devices – what’s the difference between Google’s Nest and Samsung’s SmartThings? How can homeowners be sure they’ve chosen the right product for their homes? It’s important to first figure out what exactly your home needs. Do this before even starting the research on the different devices. Do you need a thermostat as well as a security camera? Are you looking to automate your home more? Find out exactly what you want to do, then begin your research. Potentially the most important element of your smart home security device is the video capabilities. How will you be able to tell if someone is trying to do something bad if you can see them? Take the Dropcam by Nest for example. You won’t have to wonder what security systems work with Nest when you purchase a product directly from them. This Nest Cam helps to deter intruders with a 24/7 live video stream you can view on your phone or tablet. It also features motion and sound alerts as well as night vision and a digital zoom. There is a two-way audio so you can ward off burglars or great guests. Set up a system can be hard unless you have an electrician who knows what they’re doing. There are some devices that allow for wireless connections, performing all safety features over a Wi-Fi connection. The Arlo Pro does just that. It comes with a central receiver as well as one HD camera that can cover your home at any angle. It uses your home Wi-Fi to send HD videos straight to your devices. Even though it is wireless, don’t worry about charging. The battery lasts a long time and when it does need to be charged, it uses quick charging technology. This device also for two-way audio. It comes with night vision capabilities and a loud alarm to scare any intruders. It syncs great with smart devices to allow for voice controls. Smart devices are the future. Getting these devices to work with security devices will help create a more secure world. When you can see what’s going on around your home with a click of a button or a voice command, you can help keep your family and home safe. Secure Tech is proud to serve the security needs of Santa Clarita residents and business. Our technicians specialize in low-voltage electrical projects. Security systems are our forte. We are here to help keep you and your family save in your home. 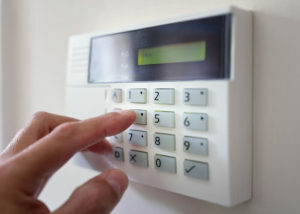 If you are interested in getting a quote for a new security system in your home, give us a call today at (800) 773-2873! This entry was posted in Security Systems and tagged smart devices, smart home. Bookmark the permalink.